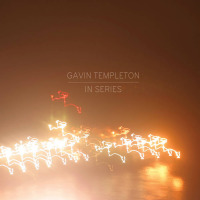 LA alto saxophonist Gavin Templeton's sophomore release as a leader, Some Spinning, Some At Rest represents the values of composition and free-improvising with equal fervor and expertise, and alongside double-bassist Richard Giddens and drummer Gene Coye, Mr. Templeton has documented one of the finest saxophone trio recordings in recent memory. 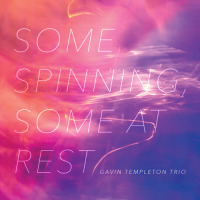 Templeton's soulful, yearning vibrato opens "Exit Row," teasing a raw, primal groove from Giddens' groaning pizzicato and the fulsome architecture of Coye's sticks-on-skins. These two mesh like the gears of a fine Swiss watch, and the leader rides their interlocking motion with a controlled abandon that sends chills down the spine. Organized around Giddens sputtering vamp in seven, "Around Arroyo," shifts focus rapidly under the guidance of Coye's hyper-vigilant meter which pulses like a volcano about to erupt. Over the wicked strip-joint slow dance groove of "Hot Mop," Templeton slithers, coils, and strikes like a viper. Bass and drums interact with a connection eerily reminiscent of the Fred HopkinsSteve McCall tandem in Henry Threadgill's Airseamlessly tailoring a deep, sturdy pocket. Speaking of pocket, there's a monstrous one on "Secrets," which motors along on the strength of Giddens' huge whole notes and the crackling snare of Coye, daring Templeton to let loose with startling velocity and impassioned multiphonics, yielding to a bass-and-drum essay of synchronous spasms. There's a wonderful sense of contrast throughout this disc like the toggle between brutal body-shots and tender strokes on "Not Tonight" or the yin-yang drama of "There You Go/ Tooth & Nail," which evokes a bit of Arthur Blythe with its piercing long-tones, roiling percussion and Persian dance motifs. Templeton has been lighting fires around Southern California for a few years now in bands led by both the legendary, Vinny Golia, and the emergent, (Daniel Rosenboom) (Joshua White), and with the release of Some Spinning, Some At Rest his stature as a force to be reckoned with in the creative music community is beyond argument. Highly recommended. Track Listing: Exit Row; Around Arroyo; Hot Hop; Secrets; Not Tonight; There You Go, Again/ Tooth and Nail; Exit Row Reprise. 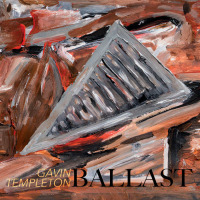 Personnel: Gavin Templeton: alto saxophone; Richard Giddens: double-bass; Gene Coye: drums.